6th Trends in Head and Neck Oncology (THNO), Nice, France · 2017, Le Tourneau C. et al. 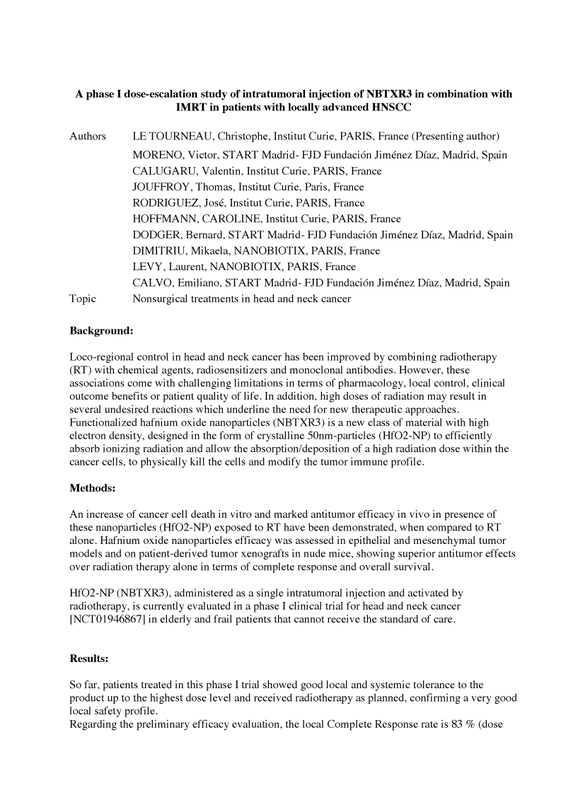 Loco-regional control in head and neck cancer has been improved by combining radiotherapy (RT) with chemical agents, radiosensitizers and monoclonal antibodies. However, these associations come with challenging limitations in terms of pharmacology, local control, clinical outcome benefits or patient quality of life. In addition, high doses of radiation may result in several undesired reactions which underline the need for new therapeutic approaches. Functionalized hafnium oxide nanoparticles (NBTXR3) is a new class of material with high electron density, designed in the form of crystalline 50nm-particles (HfO2-NP) to efficiently absorb ionizing radiation and allow the absorption/deposition of a high radiation dose within the cancer cells, to physically kill the cells and modify the tumor immune profile. HfO2-NP (NBTXR3), administered as a single intratumoral injection and activated by radiotherapy, is currently evaluated in a phase I clinical trial for head and neck cancer [NCT01946867] in elderly and frail patients that cannot receive the standard of care. At the 2017 THNO in Nice, France, prof. C. Le Tourneau presented preliminary results of NBTXR3 in patients suffering from HNSCC. The treatment was associated with a positive safety profile, and preliminary effiacy evaluation, the local Complete Response rate is 83% (dose level 15% and 22%), with a duration of response of 22 months.